ZA757 - PAPI Light - ATG Airports - Description - The Precision Approach Path Indicator (PAPI) unit provides two colour (red and white) approach path information from a wingbar arrangement. Fully operational from 100% to 0.3% brilliancy, the ZA737/757 typically provides 3000 hours of useful lamp life. The ZA737 is a three lamp unit; the ZA757 is a two lamp unit. Both have identical 2’ to 3’ of arc transition performance but the three lamp units allow for one lamp out per unit but still leaving a fully operational wingbar. 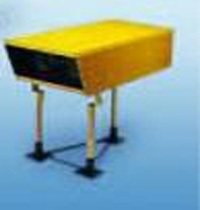 The units can be converted to CHAPI by inserting CHAPI filter gate.